New artists often find watercolor painting extremely stressful. Considering many people take up art to reduce stress this is not a good thing. The main problem with stress and watercolor painting is that when you are in a state of stress you stop observing. Yet observation is a critical factor when painting with watercolors. Stress can come about from a number of different ways. Some of us are naturally in a permanent state of stress due to our upbringing, work and general environment, etc. Handling this type of stress is not something I want to tackle in this article. 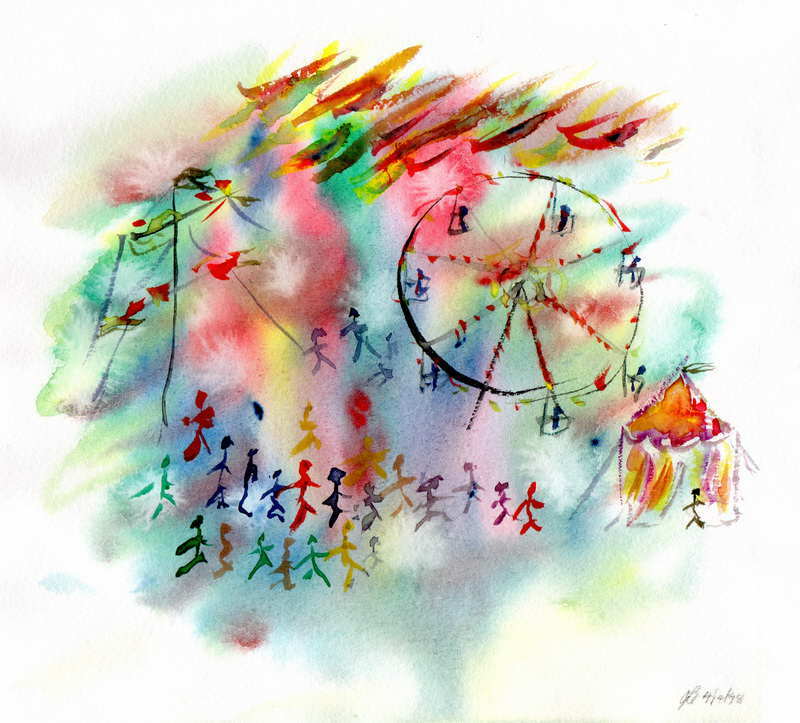 I am mainly talking about the stress that can come from the act of painting with watercolors. Watercolor paintings can seem to have a mind of their own at times. One can begin to feel that your watercolors have gotten out of control. If your work is not progressing and you find yourself doing the same thing over and over again this can be stressful. This constant repetition can make you feel you are not progressing which further heightens your stress. Yet when you tackle something new the chances of a messed up painting increases and up goes the stress level again. 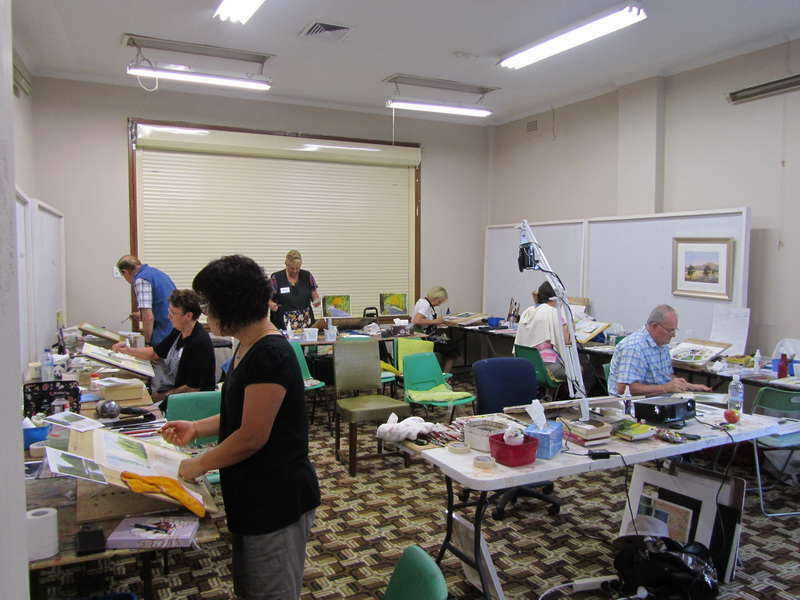 Watercolor painting workshop class Jan 2013. Sometimes stress comes from one putting too high an expectation or standard on oneself right from the start. Fixing this stress in this case could be as simple as to set realistic goals for yourself. I often have students say, during a workshop or class, that “My painting didn’t turn out as good as yours!”- usually after they have only been painting with watercolors for a few weeks or months. When you look at any good watercolor painting books you will see some beautiful artwork and it is only natural to wish to be able to produce paintings like that. However, you have to realize that those paintings did not just happen, the artist would have had many years of practice behind him, or her, to produce that work. Furthermore, it is their best work not their many failures which are in their books. When I run a workshop I make sure I always select paintings which I have already done before so there are no surprises – which can still happen! I usually begin my watercolor workshops by saying I don’t expect the attendees to produce their best work during the workshop. I tell them this in part because a workshop is not their natural painting environment. They are in someone else’s studio with different lighting and environment, maybe tackling different subjects, using different techniques and materials. They are in the company of a whole lot of strangers of different skill levels. To say nothing of having a tutor looking over their shoulder. I cover this topic to hopefully guide them towards having more fun in class. For most of you a watercolor workshop is something you do to learn – your best work will come later when you are in the controllable environment of your own studio. All of this stress is working against your watercolor painting progress because it stops you from observing! If you are stressed you stop observing what is happening in your palette and on your paper and watercolor brushes. Once you stop observing while you paint your work with watercolor ceases to progress. This in turn creates more stress which often results in people leaving the subject entirely, which is a real shame as watercolor painting can be a very relaxing and fulfilling medium indeed. Now that we have covered why handling stress is important when watercolor painting let us go to the next part of this article and look at what we can do about it: Stress management techniques for watercolor painting.